Creating a dialog has always been the best way businesses connect with new customers! An email is designed to do just that. 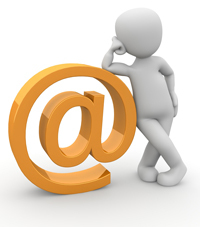 Here are 6 email marketing tips to create a GREAT campaign. Try to keep it no more than four sentences long, with space between each sentence. Writing your content in a single bulky paragraph can put a reader off. An example of an impersonal email can be a bland introduction like: “Hello Friend” or a subject line like “Save Big” or “Call Now!” The emailUSA® team recommends that the text in your email be similar to a conversation you may have when first meeting a prospect. We will use two subject lines as an example. The first subject line is a special and the second one is a benefit: “Doug’s Lawn Care: Receive 10% off of your first order” would be considered a special. Here is an email headline for the same company that can seemingly benefit the consumer: “Get 4 hours of your weekend back with affordable lawn care services”. This example would be a benefit, and is by far a better message for the consumer or prospect. What action do you want the recipient to take? If all you want is a 15 minute conversation with them, be clear about it. No, a single email is not an email campaign. Think of your email campaign as a series. Create a complete campaign with each part in mind, keeping emails consistent through insightful content or increased incentive.